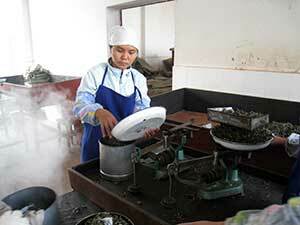 Although Pu-erh tea can be sold in loose leaf form, it is usually sold as a compressed tea. 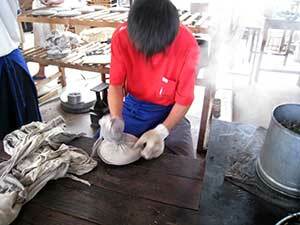 Pu-erh can be compressed into a round cake, a bowl-shaped form known as “Tuo Cha,” a mini Tuo Cha, a mushroom-shaped cake, a rectangular brick, and a variety of other shapes. Long ago, when Pu-erh tea was transported by horse caravan to Tibet and other far away provinces, it was compressed for the purpose of easy transport. 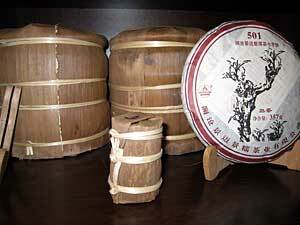 Seven cakes were then packed into a “tung” (a stack), wrapped in bamboo shoot leaves and bound with bamboo lashings. The wrapped “tungs” were loaded onto pack horses and sent off to the destination. These compressed tea cakes were more compact than the bulky tea leaves and therefore more convenient and cost effective for long distance transportation. Compare the bulkiness of the tea before and after being pressed into a cake in the photos below. Furthermore, the compressed cakes were much easier to load and unload from horse back and could be more easily picked up and re-loaded if they were dropped. Today, the need for easy transport of the tea no longer exists. However, a compressed cake is still easy to store and a space-efficient medium for a collector to age her/her collection at home. The process begins with weighing the tea leaves according to the weight of the tea cake. 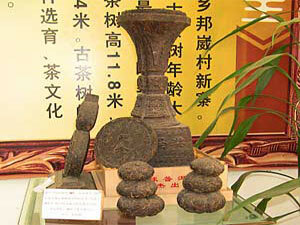 A typical Pu-erh tea cake weighs 357g (roughly 14 oz). 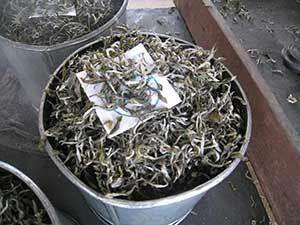 The weighed tea leaves are put into a mental canister. A label (inner ticket) is embedded into the leaves for future authentication. The canister is placed on top of a steamer. This moistens the leaves to make them pliant for pressing. 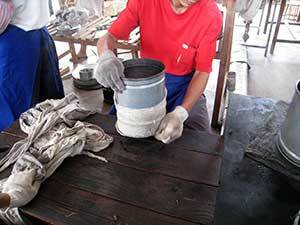 After the steaming is complete, a round cotton bag is fitted on the metal canister. When the canister is turned over, the leaves are transferred into the bag. The cotton bag is twisted to form the leaves into a cake. The excess cloth of the bag is twisted into a knot that is pressed into the cake, resulting in the dimple that is found in the middle of the back side of each tea cake. 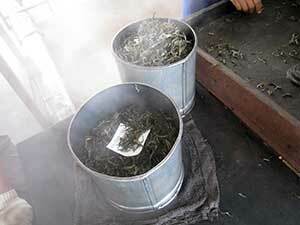 The cotton bag with the tea leaves inside is put under a hydraulic press for compression. 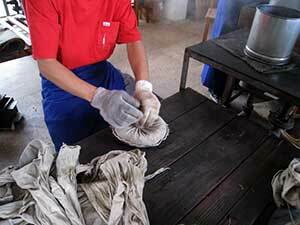 The formed tea cake is removed from the cotton bag and placed on a rack for drying. 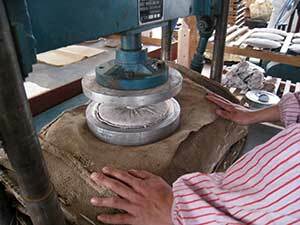 Many Pu-erh drinkers prefer the stone press over the hydraulic press as the former results in a more evenly pressed cake. The process of stone pressing is the same as above except that the pressing is carried out by putting the bag of tea leaves under a stone press that is slightly concaved at the bottom. 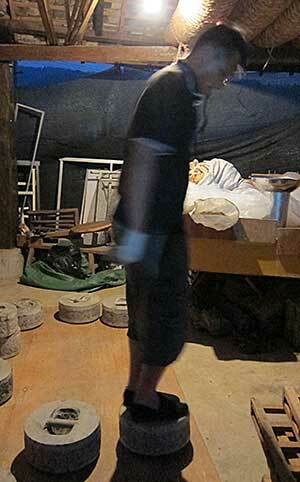 A person then stands on top of the stone press, thereby applying the compression to the tea cake underneath. 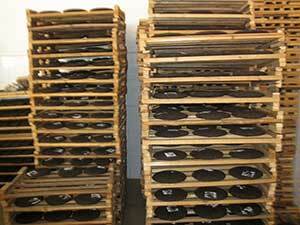 After the pressed cakes are dry, they are wrapped in a paper that has been printed with the name and other informaiton about the cake. 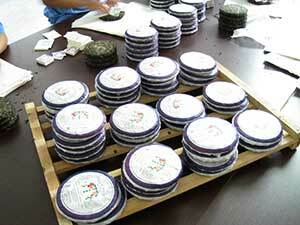 The "tung" is a traditional package of 5 or 7 finished tea cakes. 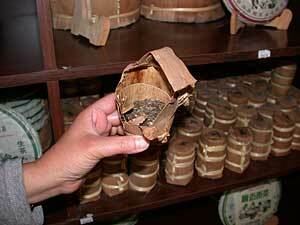 It is made of a bamboo shoot leaf wrapper and bound with strips of bamboo. This man is wrapping 5 cakes into each tung. Two different sizes of tungs are shown here. 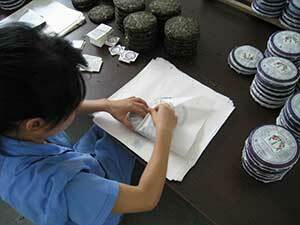 One of the unique features of Pu-erh tea is its distinct packaging and the various shapes into which it is compressed. 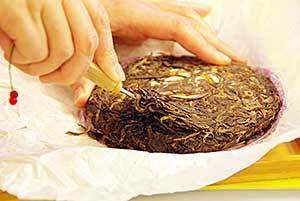 Unlike all other teas, Pu-erh tea can be in loose-leaf form or pressed into a cake, brick or other shape. 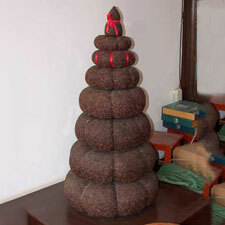 The most common shape of Pu-erh tea is the round cake (Beeng Cha). Traditionally, each cake weighs 357g, although the cakes manufactured in recent years have also come in larger or smaller sizes. After compression, each cake is wrapped with a sheet of paper made of natural fibers. 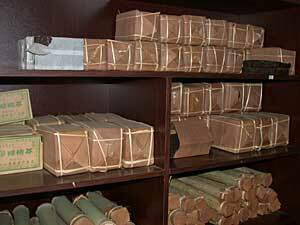 The cakes are then bundled into dried bamboo leaves, usually in a stack of seven. This is called a “tung.” This centuries-old method of packaging Pu-erh keeps the tea clean, compact and helps facilitate the fermentation process. Other common shapes of Pu-erh tea include the dome-shaped bowl (Tuo Cha), the square/rectangular brick shape (Cha Zhuan) and the pumpkin-shaped bowl. In reality, Pu-erh can be made into any shape or pattern. 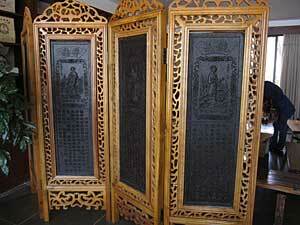 Yunnan Agriculture University, College of Pu-erh Tea even has a panel of decorative with fancy designs screens made of Pu-erh tea. 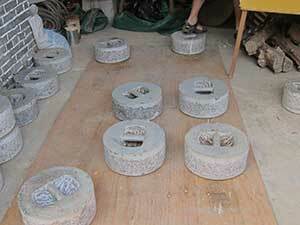 To see video on how tea cakes are pressed, click here. Hold the pick as you would hold a steak knife. 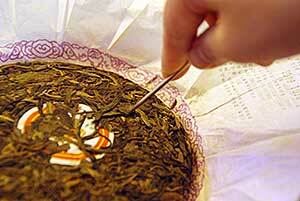 With one hand firmly stabilizing the teacake, insert the pick with the other hand into the side of the cake. 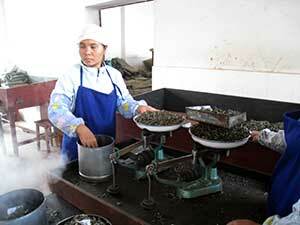 Note that the point of the Pu-erh pick is always directed away from the other hand. 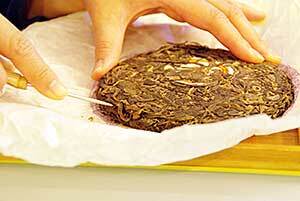 Move the Pu-erh pick up and down to loosen the compressed leaves. Do not begin the prying of the leaves from the flat surface of the teacake as the area closest to the center of the cake is the thickest and the hardest. As such, attempting to pry loose the leaves from the center would be frustratingly difficult. Additionally, some teacakes are pressed with the more tender and intact leaves on top and bottom with the broken leaves in the center. It would make a more even brew if the leaves are chipped off from the periphery of the cake while working toward the center. Pick up the appropriate amount of loose leaves for brewing. If your pick has a tip cover, place it back on. 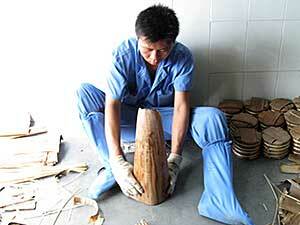 The Pu-erh pick is a sharp implement and, as such, can be dangerous to use if it is not handled with care. It should be kept away from children at all times.